One on left is Wilma. And is a pure Lanner falcon out of our birds Larry and Cassie. 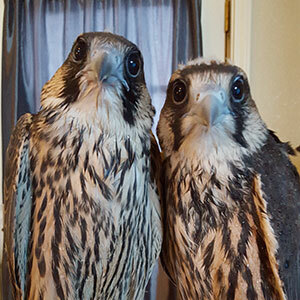 The one on right is Betty, out of Larry and a Barbary falcon owned by Martin Stainsney. He was a true star as a bird control officer at Travis Air Force Base where he started there as a sergeant. He climbed in rank until his retirement as a Warrant officer, three years ago. Since his retirement from the Air Force he has continued his work with us and is the father to Cassie's first baby. 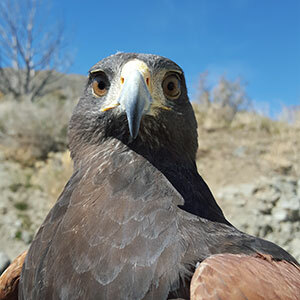 Larry will continue to work with both Raptor Adventures and Tactical Avian Predators. 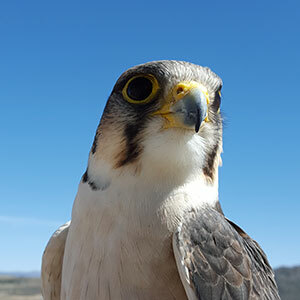 Is a ten year old female Lanner Falcon (Falco Biarmicus). Cassie spent her first nine years doing flying demonstrations. We obtained her last year for Raptor Adventures and this year she decided that she wanted to be a mother! 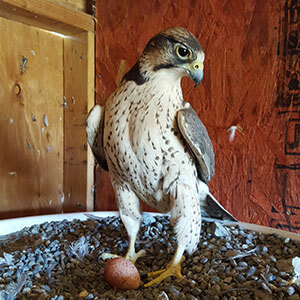 Cassie layed her first egg in February. She was inseminated on February 29th. The egg is fertile and is is scheduled to hatch around the 11th or 12th of April! Stay tuned for more pictures of the egg hatching. Sonja came to us for hunting last year after being used for commercial bird control. Sonja is a big beautiful girl, super smart, curious and a flashy flyer. 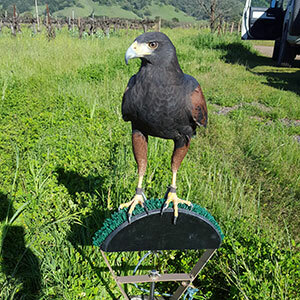 Is a two year old female Harris Hawk (Parabuteo Uncintus) and she came to us after being used for hunting her first year. She is shy, big and beautiful. She has unuasually huge feet !! Come meet her and get to know her yourself as we are learning more about her also. Is a ten year old Lanner Saker Hybrid. He can be seen on many of our TV appearance’s. Mythbusters, Hyundai advertisement.